"Just before the dawn breaks, Boro the Caterpillar hatches from an egg in the grass..."
Hayao Miyazaki is hard at work on his next Studio Ghibli film, How Will You Live? The film is expected to come out in 2020 (to coincide with the Summer Olympics in Tokyo). But we’ll be getting new work from the 77-year-old animator much sooner. In two months, to be exact. Hayao started working on Boro the Caterpillar, a short film, back in 2015. In typical Ghibli fashion, few details were released about the project. And Boro was largely forgotten about by fans after Hayao announced he was creating his first feature film in over a decade. But, thankfully, Hayao saw Boro through. The 15-minute short will start screening at the Ghibli Museum, located in Mitaka, Japan, on March 21. 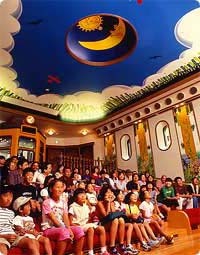 The Ghibli Museum screens a rotating selection of short films inside its celestial-themed movie theater. Boro will join films like Water Spider Monmon and Mei and the Kittenbus (the sequel to My Neighbor Totoro). Interested in seeing the first-ever public screening of Boro? Tickets for March visits to the Ghibli Museum go on sale next month. You can purchase one here.